Blast chillers are the devices that are operated in commercial kitchens for quick cooling of foodstuff, either fresh or pre-cooked by diffusing a cool air in it maintaining its essence. Blast chillers are the machines operated with HACCP (hazardous analysis and critical control points) standards which conserve the quality of food healthiness by forbidding it from all sort of risks. In the blast chillers, temperature reduces from 75°C to 2°C in not more than 95 min when it comes to cooling and for freezing blast chillers are required to reduce the temperature from 75°C to -17°C in just 250 minutes. Blast chillers increase the life of food products. The food preserved in blast chillers is much healthier than standard freezers as it prevent all types of risk to maintain the healthiness of foods. Dairy products (breads & desserts) and sea foods are stored in commercial kitchens. Different types of blast chillers are available with different specialties such as reach-in blast chiller freezer are used for reducing the temperature of hot foods in just few minutes and so on. Increasing eagerness about blast chillers is making the substantial growth in the region of Asia Pacific and leading the region to dominate the Blast Chillers Market. The global market of blast chillers are mainly driven by the facts such as increasing demand for preservation of food items, maintenance of quality of food etc. Nevertheless, there are certain factors that restrict the market from growing, i.e. availability of different alternatives that are also cost friendly such as normal freezer etc. The emerging food service equipment market is anticipated to reach USD 43.02 billion by 2024 from USD 28.0 billion in 2016 and predicted to grow at a CAGR of 7.0% over the forecast period. 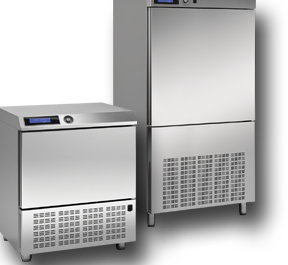 Blast chiller is a segment of food service equipment market. Global blast chillers market is expected to reach USD 6.45 billion by 2024 from USD 4.2 billion in 2016 at a promising CAGR of 5.0% over the forecast period. In bakery shops, confectionery shops and ice cream parlor, large quantity of foods are kept for longer duration and big space is required for refrigeration so roll in and roll thru blast chillers have the largest market share in product wise segmentation. Roll in and roll thru blast chillers are accounted for around 38% of market share in 2016. Based on the region, Asia Pacific holds the market share of 35.0%, in 2016. Increasing enthusiasm of end users to adopt blast chillers, preservation of foods etc. are some of the factors that drives the growth of Asia Pacific region. Asia pacific region is anticipated to reach USD 2.25 billion by 2024 from USD 1.47 billion in 2016. China is the biggest contributor in Asia Pacific due to increasing number of restaurants and hotels etc, and expected to hold the market share of 30% in the forecast period. North America is the second dominating region in global blast chillers market. The region is accounted to hold the market share of around 27% in 2016. Global blast chiller market in North America is driven by some of the key factors such as advanced technological products and accelerating demand for instant foods. North America region is anticipated to reach USD 1.74 billion by 2024 from USD 1.13 billion in 2016. Increasing number of restaurants is the main driver that is boosting the demand of blast chillers. Also the latest advanced technologies such as touch screen controller that are coming in blast chillers market as well as introduction of eco friendly technologies are propelling the growth of blast chillers market. The global blast chiller market is also driven by the fact that mostly end users are adopting blast chillers for preservation of foods and at the same time maintaining the quality of foods. However, there are some restraints that restrict the growth of market such as rigid regulation, high cost of blast chillers, high electricity consumption, alternatives of blast chillers etc. These factors curtail the growth of global blast chillers market. Traulsen a U.S based company has launched new blast chillers recently with advanced technologies of auto start, auto push, easy handle etc. Electrolux Company is also launching blast chillers for household purposes for innovative food taste. Environment friendly models of blast chillers utilize the properties of hydrofluoroolefin refrigerants like its ultra low global warming potential (GWP) and low ozone depletion potential (ODP) in order to consume less electricity.